Grab this quintessential Ethan Stowell pasta ($10) from 5 to 7 p.m. nightly. Intriguing, addictive morsels ($11) to pair with one of the bar’s unusual beers. Thick-cut Grand Central como loaf toasted (and buttered) to order ($3)—the gold standard for pre-dinner bread service. Fried balls of risotto and mozzarella ($6), as close to perfection as the pizza. Pre-dinner snacks ($9) so good you’ll never miss the potato. One long marrow bone, roasted and served with crostini ($5.99)—best with a margarita. Upscale deep-fried perfection ($16), in a tongue-in-cheek takeout box for dining in. 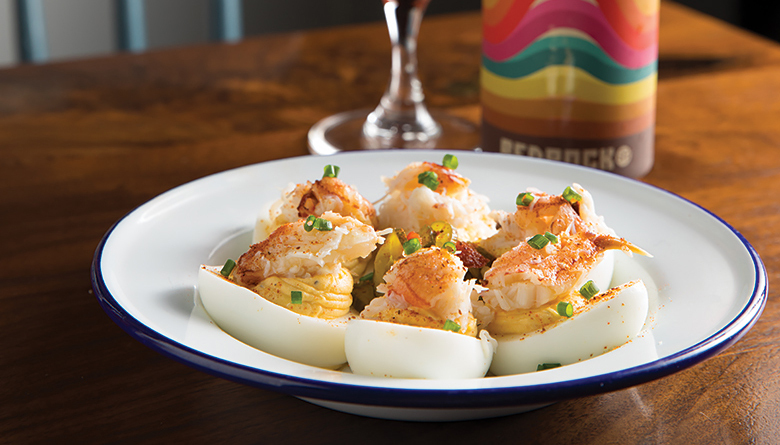 A gilded lily to be sure, these deviled eggs ($14) are bettered by a pile of crab.